Quartz is one of the most well known minerals on Earth. 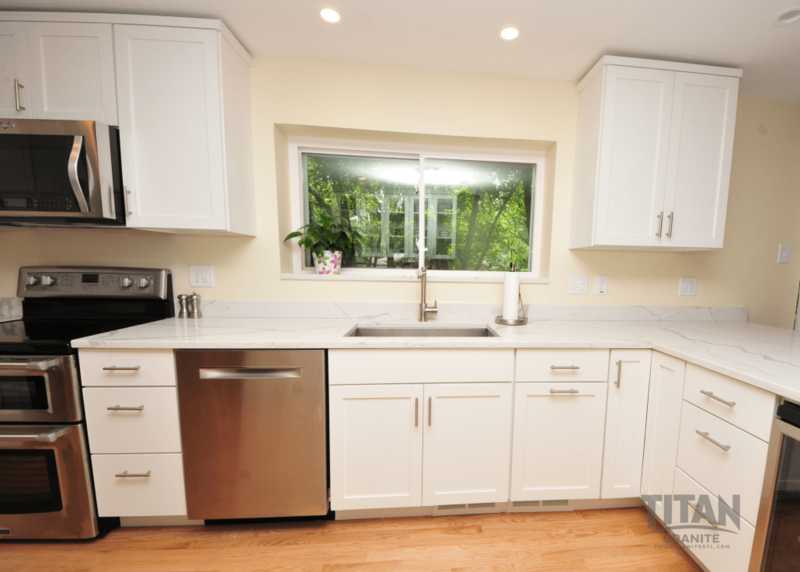 Quartz countertops are man made and composed of a mixture of natural minerals and resin. The typical Quartz to resin ratio is 93% Quartz to 7% resin. 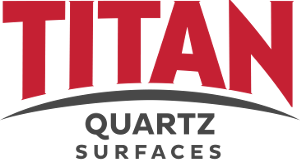 Through extensive engineering, a manufacturing process was developed utilizing intense pressure and heat to increase the color consistency, stain resistance and strength of the Quartz Countertops you can see in Titan Granite’s Showroom. Quartz Countertops are just as strong as Granite making them equally as desirable for use in Kitchens, Bathrooms and bar tops. Since Quartz is non-porous, your Quartz Countertops do not require regular sealing. This quality also makes them stain-resistant. Spilling a glass of red wine on your Quartz Countertop will only require a quick clean up. Since Quartz is man made, the color combinations the engineers come up with are endless. Whatever décor you have in your home, Titan Granite has a Quartz slab to put the finishing touch on your kitchen, bathroom or bar area. Quartz has the potential to discolor over time, especially when exposed to UV rays from the sun. 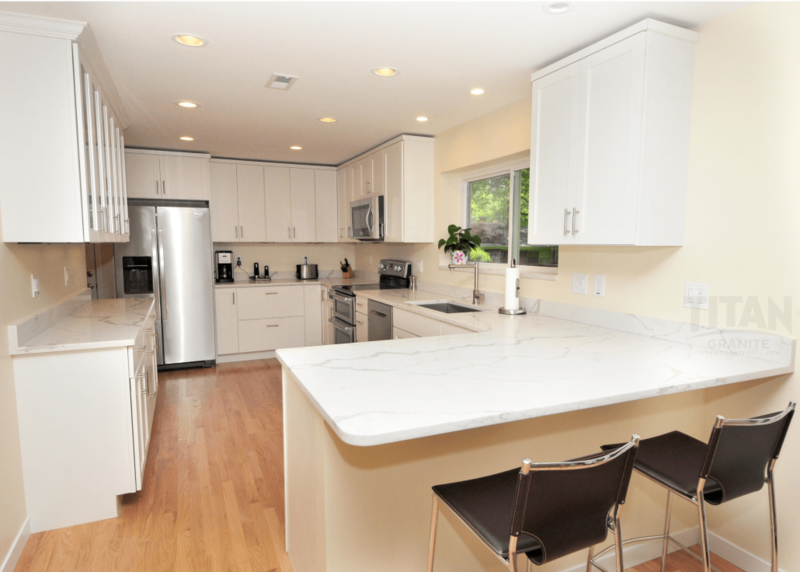 As Quartz Countertops continue to grow in popularity, more and more manufacturers are producing Quartz. There are a variety of Quartz brands all of which have their own line of colors available. Throughout the variety of brands, there isn’t one that is necessarily “better” than another. Some brands have been around longer than others but ultimately, when choosing a Quartz countertop for your kitchen or bathroom it really comes down to color and price. As with any countertop, regular cleaning is necessary to keep counters clear of bacteria and germs. Quartz is a non-porous stone making regular sealing unnecessary over the years. Quartz is not resistant to high heat due to the resin product it is created with. Quartz Countertops can and will discolor or change the structure of the surface if exposed to high heat. This FREE resource provides you with a list of 5 questions you should be prepared to ask your Granite Supplier before purchasing your new countertops. Titan Granite offers FREE in-home countertop estimates. Schedule your estimate TODAY and get started on your new Granite Countertops.